Dropping into Tuesday night board games at Quarterstaff Games last night, I finally got to try my hand at Android: Netrunner, the latest of Fantasy Flight Games’ living card games, and the next iteration of a beloved collectible card game, Netrunner, designed by Richard Garfield himself. I’m honestly not sure what about Android: Netrunner caught my attention — probably the same thing as Dominion: the galaxy of possibilities in playing the game without necessarily the same level of investment as a traditional CCG; plus the extension of the Android universe, which we local fans think is one of the original game’s greatest assets — but I’ve been following the discussions on Boardgamegeek.com since the first announcement. And while I’ve stopped following those discussions because they invariably looped back to the pros and cons of the living card game format and whether X card or faction is wicked broken, I maintained my interest. With only one play under my belt as the criminal runner Gabriel Santiago against Haas Bioroid, it’s hard to say a lot that’s helpful or likely to be terribly accurate. But that never stopped anyone before, did it? 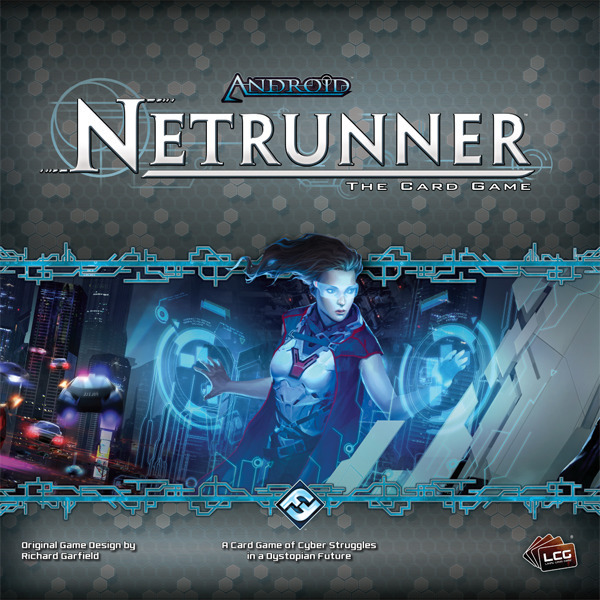 Part of what drew me to Android: Netrunner was that it was supposed to be playable out of the box, particularly in the wake of having been interested in the Call of Cthulhu card game until I let those arguments about the “need” to own multiple core sets to play it properly dissuade me from exploring further. Android: Netrunner, however, absolutely is playable out of the box. Pick a faction, add the neutral cards to those and you’ve got a deck. While I lost against Haas, it didn’t feel like an unmatched loss, if you know what I mean. There were cards that worked together and I was able to see some of those match ups from the very beginning. I didn’t really know what I was doing for the first half of the game, so maybe I dawdled or didn’t generate enough cash regularly enough — there were more than a couple turns where all I did was drum up credits, especially once I figured out that Sneakdoor Beta is a persistent effect letting Gabriel use his ability against a second of the corporation’s core servers — but I started to get the sense of recognizing when the corporation’s resources are low as part of dancing around its intrusion countermeasures. It was a first brush with a new game. I liked it for the most part. The prospect of having multiple first brushes with Android: Netrunner is a little intimidating, owing to the number of factions with unique cards to learn how to use, but it’s also a promise of lots of variability in play. It’s kind of like opening a new Dominion expansion, only the entire game is different and there are cyborgs. There was also the slow process of “All right, so I spend a click to go on a run, then the ICE requires this strength hacking, which means this program needs this many clicks . . . ” but you’ll have that with any game. I repeatedly found myself in the position of discovering halfway through a run that I didn’t have enough credits to bypass all the subroutines. In retrospect, I wonder if I was playing too cautiously, being unwilling to take the consequences. Particularly with regard to the final, make or break run. I can’t remember now if the credits I spent on the layers of ICE were something I could have saved by taking the penalties of the subroutines. Best of all, it was fun to play without worrying about deckbuilding at all. I’m looking forward to trying out all the factions, on both the runner and corporate sides of the board. I may have to rethink my decision not to pick up Miskatonic Horror. Last night at Quarterstaff, Dan took advantage of the store’s Facebook check-in discount to snag the latest expansion to Arkham Horror. From online accounts and promotional material, I already knew it was a heap o’ new cards to mix into all the other existing expansions. But I didn’t know much in the way of the details. And that’s Miskatonic Horror got my attention. Take the mythos cards, for example, the ones that determine where gates open, clues appear and other generally terrible things. One of the biggest drawbacks to mixing expansions is the mythos cards affecting the expansion towns — Dunwich, Kingsport and Innsmouth — are generally overwhelmed by all the cards affecting only the town of Arkham, which come from every other expansion. In Miskatonic Horror, the designers came up with what seems like a neat way to resolve that. All the mythos cards have two gate locations listed. The rule is that on drawing, a gate opens at the top listed location if that location is in play, otherwise the gate appears at the second location. The same seems to hold true for clue tokens appearing, so this could be a very slick solution to making the outlying towns more active as well as appealing to visit. Who wouldn’t want to stroll around sleepy, gateless Kingsport, hoovering up precious clue tokens? I will endeavor to be a smart consumer and give this a couple plays before picking it up myself — Dan’s already talking about holding an “all-in” game at his house — but Miskatonic Horror‘s off to a strong start in drawing me in. We got a sneak preview of Small World Underground at Tuesday night board games at Quarterstaff Games. Underground is a stand alone sequel to the original Small World and it plays very similarly. The action goes deep, as a horde of races invade an enormous underground subterranean, a living space perhaps even more prone to overcrowding than the surface world. Most of the rules are the same, so if you’re a Small World lover or hater, I don’t think trying this version would swing your opinion very far. There are some new or altered elements to make the game play a little differently, though. Relics and places of power, for instance, are randomly drawn from a supply as players conquer regions occupied by monsters, which take the mechanical place of Small World‘s lost tribes. So there’s a new dynamic, as players jockey for control of artifacts that help them conquer regions or gain coins. Underground continues the whimsical, sometimes dark fantasy theme of the first game. The races include lizardmen, fire elementals and some very fetching krakens. The art style is consistent with previous products, although Underground‘s race and power banners and badges are colored to be distinct from others published so far. Between the two sets, I think I like Underground a bit more and not just for the novelty factor. It seems to have benefited from designer Kayearts’ experience in creating the original game and expansions. The new races are less concerned about controlling regions with particular icons for extra coins, which was an element of the first game I found less than stimulating. You have to think a little harder about how to make Underground‘s races and powers work together. In short, Small World Underground is as fun as, if not more so, than its older sibling Small World. Some people might find it to be a simple reskinning and thus not worth their cash, but it also works as a partial expansion, bringing in races that work with the overworld board — or bringing surface dwellers down into the cavern — as well as the relics and places of power. Give it a try if you can. If you already know you like Small World and have been been considering buying a copy of your own, Underground will serve you just fine. I had my first taste of the new Dominion expansion Cornucopia the other night at Quarterstaff Games. It was mostly an exercise in frustration, as Jester was in play and most of the other players at the table decided to make use of it. Jester’s a 5 coin attack card that gives the user +2 cards, then forces everyone else to reveal the top card of their deck. If it’s a victory card, they gain a curse. If it’s anything else, the player of Jester has the option to gain a copy of that card for their own deck, or put a second copy in the other player’s deck. So everyone was gaining lots of copper and curses. Because once you get a single curse in your deck, Jester’s eventually going to turn it up. Then they really start breeding. The smart decision would have been to pick up some Masquerades, as they were the only trashing card available, but I wasn’t smart about and opted to blunder along in my solitaire way. Another player did pick up some and I was lucky enough to trade away a couple curses to my left hand neighbor, for which I was grateful. So that really colored my perception of Cornucopia. Sure, it was a first play and I need to give it a few more tries with other cards from the set. But that doesn’t stop me from still getting annoyed by attack cards; annoyed to the point I generally write the game off completely if there are any in play. I can’t believe I’m typing this, but I dislike attack cards because they’re so sub-optimal. With the array of options typically available in a Dominion spread, there’s almost always something more productive for a player to do than use an attack card, as they tend to be terminal actions, in that they don’t allow the player to do more unless they’ve previously used other cards to rack up some actions and money. I don’t want to use attack cards because they do so little for me. Or they seem to at least. Militia is useful because it scrounges up some money and I can see the use in Witch and Jester because they give more cards, but generally I feel as though I’m wasting time attacking others when I could be doing more improving my own deck. Not that I’m terribly good at deck-improvement, mind. If it’s not a Mine, I still have not developed that killer instinct for weeding crap from a deck to get at the good stuff. As promised, Small World Underground is now in my hot little hands for the prerelease demo fiesta next Tuesday at Quarterstaff Games. I don’t know how much I ought to say, but merely by pawing through the box, I notice a number of differences from the original Small World. Small differences, but present. They even altered the token tray, seemingly for the best. Let the token punching commence! Days of Wonder posted a list of game stores participating in a nationwide preview of Small World Underground. Among them, nearest to me in terms of geography is none other than good old Quarterstaff Games in Burlington. And I get to help by running the preview — which probably consists mostly of learning the rule differences between Underground and its sunnier sibling. When the game was first announced, I noticed with interest that it “can be combined” with the original set, but that’s not necessarily the same as mixing all the pieces together for a mega mash-up game. Surely someone will concoct an “Invasion from Below” mechanic to allow the two boards to interact, if it doesn’t already exist. It’s not often you see board games getting this kind of preview buzz. Magic: The Gathering does it all the time. Even some miniatures games, I think. But previewing board games seems to be limited mostly to big shows like Gen Con and Essen. Consequently, I’m psyched that not only is Days of Wonder doing a wide preview like this, but it’s happening right here in Burlington. And I get to help. Nifty. For Tuesday night board games this week, I grabbed a hodge-podge of smaller, less frequently played games. Of them, I wound up playing Captain Park’s Imaginary Polar Expedition and Chrononauts. The latter was fun as always, particularly in contrast to last week’s Back to the Future. Captain Park’s Imaginary Polar Expedition is one I’ve played a few times before, in a sort of perfunctory way. We play it, and people don’t actively dislike it and then someone wins. This time was kind of like that in that someone abruptly won with a whopping ninety point fabrication. But people also said they liked it, so that was good. I should probably bring the Cheapass stuff more often. I still have games from that company I’ve never played; or game, at least, by the name of Spree! After that, Jon and Nonny wanted to try out Aye, Dark Overlord, an improvisational storytelling game. It’s been in Quarterstaff’s demo library for years now, but never actually made it to the play area of the table, down to it not being much of a mechanical game. Jon and Nonny have always been the theme-driven types, though, so I figured they were the best ones with whom to try this one out. It was . . . confusing. Players cycle through two types of cards, cues that they draw on to weave a story of why they failed to do the dark overlord’s bidding, as well as cards used to shift the blame and duty of story-spinning over to another player. But how and when those cards are drawn, I have no clue. Nonny usually prompted me to pull some more. And that worked out pretty well. What really confused me was how the stories we concocted frolicked all over the place. They jumped from cue to cue, frequently without weaving those cues together. I think that’s where the player in the role of the dark overlord comes in. Someone who gets the flow of the game would jump in and demand more clarification and poke holes in things more than either of our overlords did. In short, Aye, Dark Overlord is more of an exercise in collaborative improvisational storytelling than it is a game in the hobbyist sense of the word. It’s very similar to Once Upon a Time in that regard: best played in a group of friends sitting around the living room. While I think it plays much more smoothly than Back to the Future, Chrononauts still has its own issues. Like that mini-expansion that came out a couple years ago, The Gore Years. It doesn’t do a whole lot, because so few of the identities in the mix have anything to do with the four or five events it adds to the timeline. Having Lost Identities permanently added to the pile doesn’t help, of course, because that must have doubled the number in the pool, so those added by The Gore Years are more or less drowned out. It’s still fun to play, though, and a mostly immaterial addition in Chrononauts takes up significantly less room than, say, a dud Arkham Horror expansion. After a very long stretch of replaying the same games, however fun they might be, I went to Tuesday night board games this week with nothing in hand. My plan was to play at least one new title, Death Angel, the card gameification of Space Hulk, which Josh brought. When I perused Quarterstaff Games’ open play library, I grabbed Back to the Future, Straw and Dixit, just to further prompt myself to play something new. After a bit of Tales of the Arabian Nights, in which Scheherazade was lost in Leon and got totally rooked by a charlatan posing as a beggar, I jumped over to try out Death Angel. In it, space marines run through a ship infested with genestealers, trying to achieve an objective — killing the biggest, baddest ooglies of the lot, namely — before they’re all ganked. Unsurprisingly for a cooperative game, it’s tough to beat. Each player gets some number of marines to control, who move in formation through four locations. The formation is represented by a line of cards, with terrain features like doors and control panels on either side of the line. Genestealers boil out of the shadows and vents, swarming the marines. It seems like more than a bit of a crap shoot whether any marine will be in a position to attack or properly defend against the teeming hordes of monsters. I’d definitely like to try this one again, especially now that I have some idea of how it can go. Taking advantage of the door control, for example, seems to do wonders for reducing the number of genestealers on one’s six, for example. I hate to say it, but every time I play Back to the Future, I like it a little bit less. I think of Chrononauts and can’t help but see Back to the Future as the clunkercated offspring of an already quirky — but still lovable game. Which is sad, because I love the Back to the Future films. Dixit is a game I resisted playing for a long time. The rules made it sound like just another comparisons non-game in the vein of Apples to Apples, only with artwork. Only . . . it’s a bit more. And just “a bit” in a nice way. Instead of just picking a random noun from a hand of them and hoping the leader of the rounder choose it, as in Apples to Apples, players in Dixit choose a picture to go with a word, phrase, sound or story declared by the round leader. That’s the first difference: the players are engaged more than throwing cards on the table by being asked to conjure clues and interpret them. The second difference is there’s art. And it’s surreal, storybook-like art, which I dig, having gotten a good look at some of it. Flip through the pictures at Boardgamegeek and see what I mean. So there’s a creative component in Dixit that I hadn’t expected to find. There’s also a bit of game play: trying to gauge just how obvious a round leader is being with their clue. Because the leader gets points if some players guess, but none if they all guess correctly. Plus, there’s incentive for others to play cards that fit the clue, because they’ll get some points as well for offering a suitable fit to the clue. The drought of repetition has — briefly, perhaps — ended. Looking forward to next week. For the first Tuesday board game night of 2011, I led off with two rounds of Betrayal at House on the Hill — still waiting on those replacement tiles, Wizards of the Coast. The first game went much too quickly and swung straight to the traitor’s favor. The second was much longer, during both the exploration and haunt phases, eventually being won by the heroes. As a general rule of thumb, the longer the exploration phase takes, the more likely it is the heroes-to-be will find the items and rooms they need to defeat the traitor. In that second game, two of the three heroes also had the advantage of being able to hide in the basement from a pack of demons for a while, building up stats and gear. After that, Shelley produced a series of card games from her bag: Mow, Aquarius and You Robot, the first two of which came fresh out of the wrapper, so those were a learning experience for all of us. Mow is a sort of bidding game, for lack of a better description. There’s a deck of cards, each of which has a cow on it worth so many points. Some — most — cow cards also have a number of flies on them, which are worth negative points. The first player chooses a card from their hand with a numerical value higher or lower than the one on the table, placing it to the right or left, depending on whether the value is higher or lower. The next player does the same. A line, or herd, of cows slowly forms in this way. Every card played has to go at one or the other end of the line, so it becomes increasingly unlikely a player won’t have a sufficiently high or low value card to add to the herd. When someone can’t play a card, they take the whole herd into their score pile. Once the deck of cards runs out, the game’s over and all card values are added up. I think the cards in hand don’t count for negative fly points. There are also some acrobatic cows, which can insert themselves in the middle of the herd or play on top of cows of the same value. The two strategies that leaped out at me during play were to either play conservatively, putting down cards that were close in value to those already in the herd, or aggressively, playing high value cards, making it less likely the next player would have something suitable to play. The downside of the aggressive choice is herds turn out smaller and less likely to have an abundance of flies to drag one’s score down. Aquarius is a Looney Labs game, with Andy Looney’s trademark graphic style all over it. It’s a pattern matching game, in which players connect cards showing a mixture of panels of elements — fire, water, earth, air and space — together. There are several layouts of cards, such that one might be divided into four panels, each one with a different element, one larger panel with one element, and anywhere in between, as well. Whenever a card is played, an edge of an element has to touch the edge of a like element; fire to fire, water to water and so on. The goal of the game is for a player to link seven panels of the element whose goal card they currently hold in secret. Yes, the goal they currently hold. This is an Andy Looney game, after all. In addition to the element cards, there are also cards that cause two people to trade goals, make everyone pass their goal around the table, trade hands and other fun stuff like that. It can also make the game time-consuming, as not only do players block elemental chains, but they slowly figure out who’s holding which goals as they shift around the table, as well as from who’s adding to which chains of elements. I liked Aquarius, but by the time someone finally won, we were pretty much done with it, given the mental rewards of playing the game versus time invested. Finally, we tried You Robot, which Shelley likened to charades. And it is, a bit. In reverse. Played in teams, one teammate is a mad scientist who has built a robot. The other teammate is the robot. The mad scientist has a limited number of instructions it can give the robot. These instructions are in the form of six pictures: the robot itself, the robot’s head, the robot’s arm, the robot’s hand holding a rod, an arrow and a pair of circular arrows pointing at each other. Using only these cards plus the word “stop,” the scientists try to instruct their robots to take a particular position: sitting in a chair, kneeling in a praying position, making glasses out of their eyes, and so on. This is bound to be a fun party game, with or without the lubrication of alcohol. As it was in the setting of Quarterstaff Games’ play area, a good bit of my enjoyment came from being the table of people getting up and moving around in funny ways while everyone else played more conventional board games. Elsewhere that evening, there was a marathon series of Small World games, one single mind-blowing struggle after Hastur in Arkham Horror and a merry-go-round of Dominion, 7 Wonders and Fantasy Flight’s new version of Civilization. Last Tuesday, Andrew led us through 221B Baker Street, a vintage board game in which the players are all detectives investigating a crime that left Scotland Yard utterly perplexed. It was an obviously well-loved copy from his youth. Andrew had a couple funny reminisces about playing the game with his siblings. In 221B Baker Street, sleuths first learn what they’re up against by reading the case card. We played “The Case of the Bashful Benefactor.” The case card gives the story leading up to the start of the investigation and sets the goals, the pieces of information needed to solve the insoluble, usually items like a motive, a killer, method and so on. To answer these questions, such as “Who killed Melanie Blakesly?” players travel around the board gathering clues from different locations: the Tobacconist’s, the Pub, the Carriage Depot and so on. Movement uses the old school “roll a d6 and move that many spaces” technique, which conjured up memories of Clue for me. Once a detective arrives at a particular location, they look up its specific entry in a long list of clues that cover a whole stack of cases. The Carriage Depot may have clue 57 in one case and 219 in another. In some cases, a location may not have a relevant clue or no clue at all. Some clues give information about characters described in the case. Others may be segments of word puzzles. One of the goals in the case we played through, the motive of one of the characters, was a sentence made up of homonyms of questionable accuracy. Eventually, a player feels they’ve gathered enough information to be able to formulate a hypothesis about what really went on. They return to the starting point on the board, 221B Baker Street, and announce their answer. Then they privately check the back of the clue booklet. If they’re right, they confirm it to the rest of the group. Otherwise, that detective is out of the game and everyone carries on. No one in our game got the answer completely right. We all got pieces of it, some more than others, but never all four, which is the requirement for winning. 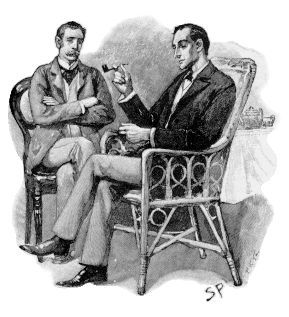 When I finally got back to Baker Street with a full notebook of clues, I spent four or five passes around the table trying to make sense of that really terrible wordplay puzzle. Rolling the die isn’t the only thing that determines who gets to which clues first. At the start of the game, each player has a police badge and skeleton key card. The badge can lock one door of a location — a few have multiple access points, which can be useful in getting around the board — keeping other players from reaching the clue there, while the skeleton key removes the badge permanently. More keys and badges are available at the Locksmith and Scotland Yard locations, which can play a role in how one chooses to move around the board, particularly if people are being aggressive about barring other detectives from certain clues. I used my first badge early on, acquired another sometime later, but then never thought it to use it, even though there were still players who hadn’t acquired clues I was reading. Before we started, Andrew warned us that the game can take a long time. I thought he was referring to individual turns running long. Actually, it’s because the turns are so short: roll a die, move your pawn that many spaces. If you end in a location, look up the relevant clue in the clue book. There is, however, only one clue book for six people. This leads to needing to track who gets the clue book next versus whose turn it actually is. There can be five people waiting for the book while the sixth copies down their clue, only to learn it’s time for them to roll and move again. 221B Baker Street is a weird game. It’s got that super simple roll and move mechanic attached to what are logic puzzles and brainteasers. I can see playing just the puzzle aspect by giving everyone the clues, but they’d probably need their difficulty upped to still make it fun and draw the game out; maybe by specifying the order in which they’re revealed and ensuring they’re all interdependent. To continue the retrogaming theme, Nonny broke out Talisman after that. I was distracted by Betrayal at House on the Hill and Tsuro before taking up an abandoned Thief in Talisman, who, to be honest, is probably a little broken when you can lift the wand from someone just by saying so.